Decoration Day, Monday, May 30, was observed by Crittenden Post, G. A. R. located at Marion. 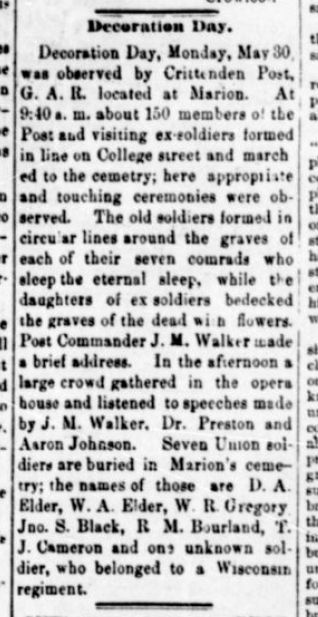 At 9:40 a. m. about 150 members of the Post and visiting ex-soldiers formed in line on College street and marched to the cemetry [sic]; here appropriate and touching ceremonies were observed. The old soldiers formed in circular lines around the graves of each of their seven comrads [sic] who sleep the eternal sleep, while the daughters of ex-soldiers bedecked the graves of the dead with flowers. Post Commander J. M. Walker made a brief address. In the afternoon a large crowd gathered in the opera house and listened to speeches made by J. M. Walker, Dr. Preston and Aaron Johnson. Seven Union soldiers are buried in Marion's cemetery; the names of those are D. A. Elder, W. A. Elder, W. R. Gregory, Jno. S. Black, R. M. Bourland, T. J. Cameron and one unknown soldier, who belonged to a Wisconsin regiment. Source: Crittenden Press. (Marion, Ky.) 1879-1907, June 2, 1892, Image 2 - Chronicling America - The Library of Congress.